The Home Equity Conversion Mortgage, or HECM (pronounced HEKUM), is the federally insured reverse mortgage product. It is insured by the Federal Housing Administration (FHA), a branch of the U.S. Department of Housing and Urban Development (HUD). HECMs account for nearly all reverse mortgages made today in the U.S. Following are the number of HECMs made in each federal fiscal year since the program began. 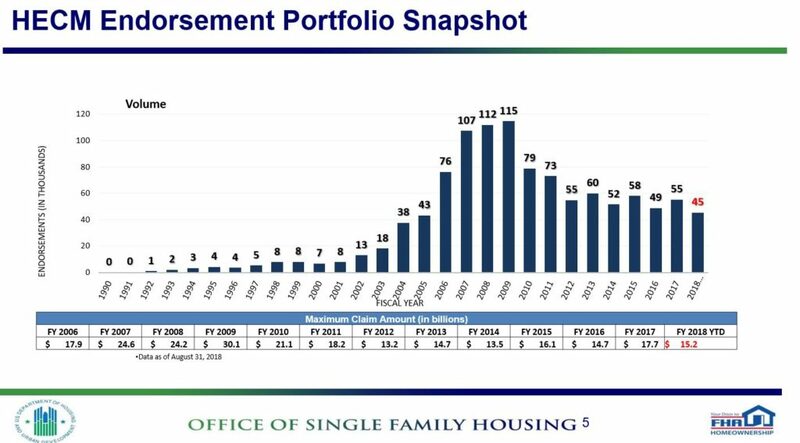 HUD provides data by federal fiscal year (each federal fiscal year begins October 1 and runs through September 30 of the following year. FY 2018, for instance, began October 1, 2017, and ends September 30, 2018).